2011: College Rising's first full year is in the books! Eduardo (left) is the first person we found apartments and roommates for. Allesandro, Allison (right) are the first people to live in our furnished by room housing! 2014: This is also the first year "Ugly Sweater Vs Bulls" Holiday party! Mean Jean our web developer (right), Witten with hands up our Broker (right) Chris in the ugly bulls sweater (middle) and some friends we made along the way. We start offering flexible lease terms and welcome students from The French Pastry School! We had so much fun that we make it a tradition! 2017- 2018: College Rising continues to be a leader in the community for leasing apartments and begins its transition to expand into a new philosophy of education. In April 2018 College Rising becomes an approved Illinois Pre-License Real Estate School! With reciprocity rights College Rising can teach and hire students in 17 different states! It all started as a simple apartment/roommate finder. Chris had a hard time finding an apartment as a transfer student coming into UIC as a junior. Chris notes “It was very difficult to find an affordable place where I was accepted as a roommate.” After searching for months Chris grew tired of the rejection, school was already starting and he decided to make a change and get a two bedroom apartment which was out of budget but thought why not flip the table and just find a roommate! Immediately Chris found a roommate and saved countless hours on commuting! The following year Chris took a different approach and sought out other students who were looking for both an apartment and roommates. 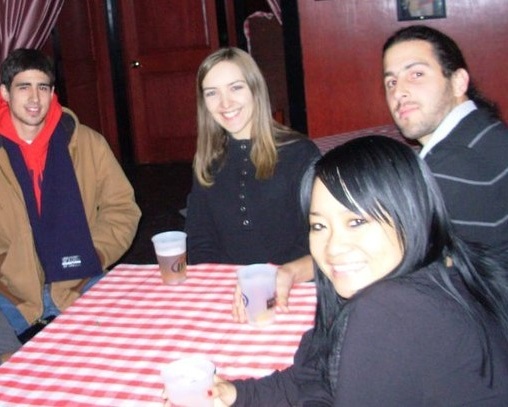 Chris landed with two students who quickly became friends and the place was perfect! A year later Chris’s landlord hired him to rent the building and upon graduation Chris spoke with family, friends and mentors to see if starting a company could be something. “We started off pretty quickly! While I attended real estate school, my roommate Burak created the logo and advertisements, my roommate Witten and downstairs neighbor Kasha helped with property research, my landlord neighbor helped find me an affordable office, UIC helped me find a free accountant and my neighbors Mikey and Kelly helped with sales!” Thus, College Rising saw an opportunity and was born in March, 2010! College Rising’s first apartment was leased in July, 2010 after much hard work and determination but more importantly fun! 2012-2014: College Rising brokers a deal with Little Italy's Festa Italians to provide a booth for College Rising to support UIC student organizations! 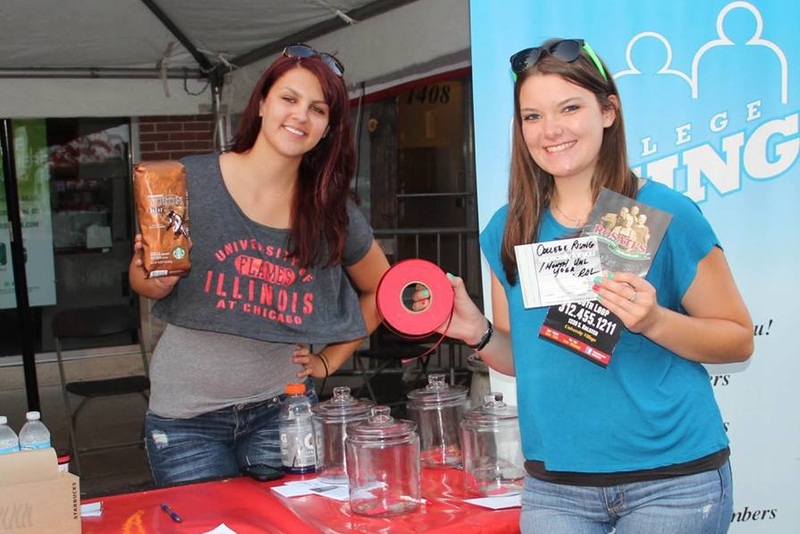 College Rising helps fund-raise for Melissa (left) and Ashley’s (right) student org. along with 30 others from years 2012-2014! Collegerising.com receives 5X amount of web traffic than 2011-2013 combined! 2015-2016: College Rising is now a full service operation. We nearly double our revenue from 2015 providing apartment leases as shared spaces, terms between one - twelve months, subleases and now also short term stay! Seeking Summer interns. Apply today! Our Rising Staff is measured not by how much we make but how much we grow, connect and follow through on our core values and philosophies. L- Listen. Prioritize listening. Be in the moment and ready to be amazed. E- Earn it. The harder we work the more we appreciate it. A- Ask. Never fear to ask for help. It might take more time but its worth it! R- Redefine. Who we are versus who we want to be. N- Need. Pay attention to fulfill your own needs equally to that of others. N. Negotiate. If asking is not enough. Negotiate what you want! G. Goals. Make goals a process which is to increase the happiness of yourself and others.